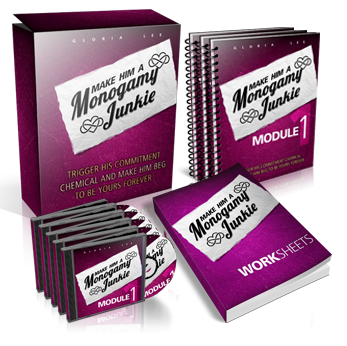 "Make Him A Monogamy Junkie"
course, including INSTANT ACCESS to all of the bonus material for only $47! You'll receive instant download access to this comprehensive guide that teaches you everything you need to know about how to get the love of the man you want, and keep it forever. You're going to learn the truth of how a man's mind really works, and what he wishes you knew (but would never tell you). This is your golden key to transform the destiny of your love life and relationships with men, and it all starts here. ...because you can listen in (with total privacy) when you're at the gym, in the car, or ANY time you have a spare moment - all the information you need to Make Him A Monogamy Junkie is right there. 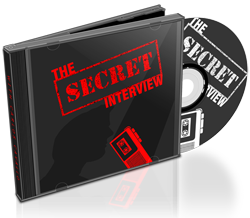 You're getting exclusive access to "The Secret Interview" Gloria did with one of America's most in-demand dating coaches, Carlos Cavallo. You get a full hour of deeply advanced material on EXACTLY how to make any guy you want (or, the one you've got now) look at you with new eyes... Even if your relationship has stalled. He'll soon experience a SURGE of desperation to make you his (and ONLY his) forever, wrap his strong arms around you, and NEVER let you go. Carlos normally charges $247 per hour - but today, he's all yours absolutely FREE. And literally 'force' his mind to dwell on vivid, exciting images of a future with YOU and ONLY YOU. This is dirty talk taken to a whole new level of class, beauty and tenderness - you won't need to say ANYTHING that makes you feel weird or uncomfortable. Limited Time Bonus (Optional) Yes Gloria! Please also give me my first edition of your Ultimate Attraction Transformation Series for FREE ($37 value). I understand that with Ultimate Attraction Transformation Series, each month Ill discover more powerful ways to spark almost nutty levels of attraction, romance, and hot heart-pounding heat with him. Ill uncover exclusive, tested, and proven secrets to long term relationship success, Ill learn how to keep my man sexually and emotionally fixated on ME, and Ill get sizzling never-seen-before interviews with the worlds top dating coaches in each issue. I understand that there is no other product on the market like this, and that I will receive the first edition today for FREE. If I choose to stay on as an Ultimate Attraction Transformation Series member, I will be charged $37 per month for each new amazing issue as long as I decide to remain a member. I can cancel at any time. Finally, I understand that my "Make Him A Monogamy Junkie" purchase is fully covered by your personal, risk-free, no questions asked 8-week 100% money-back GUARANTEE! If I'm not satisfied for any reason, or it doesn't live up to my expectations, I won't be out one red cent. I can just send an email and I will be refunded my payment. Right up to the final day of this 8 week guarantee.